The picture is painted in oil on canvas in 1919. It refers to the late work of the artist. Written in expressionism style. Edvard Munch is a Norwegian artist. He created painting for theaters, owned graphics. He graduated from the royal school of drawing. 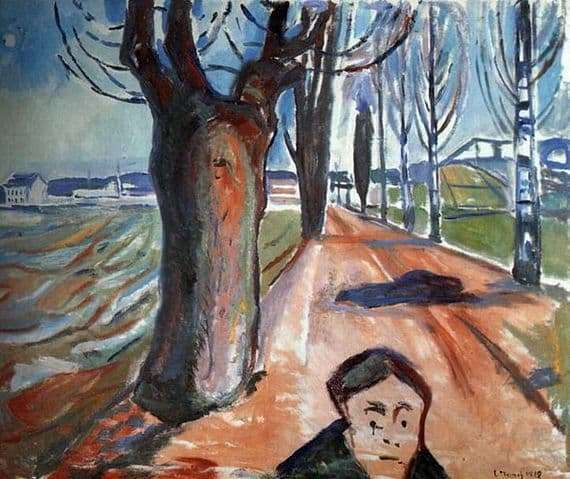 Working in France, Munch was strongly influenced by the work of Gauguin, Van Gogh, which can be traced in a certain similarity in his canvases with the paintings of these artists. The creations of the great impressionists left an indelible mark on his soul, but still, Munch created his own style – expressionism. In his works he depicted various human fears and emotions. Many paintings are written on the theme of the eternal relationship between a man and a woman. He depicts in his works love, hate, life and death, doom and salvation. It is difficult to explain why the artist chose such a theme for creating the canvas “The killer in the alley”. But still, she can not leave anyone indifferent. The canvas depicts a running killer who committed his crime. His face is depicted by simple graphic techniques, but even from these points, instead of the eyes, one can understand the emotions of the killer. In the background, Munch painted the city, as if showing that the killer had deliberately committed evil far from human eyes. The picture is drawn like a schoolboy who decided to make fun of the teacher: the lines and landscapes are depicted very simply. There are poets who wrote poems on the subject of this picture of Munch.